Mid-April and finally an igloo! This winter it really looked as though one wasn't going to appear, for the first time in many years. 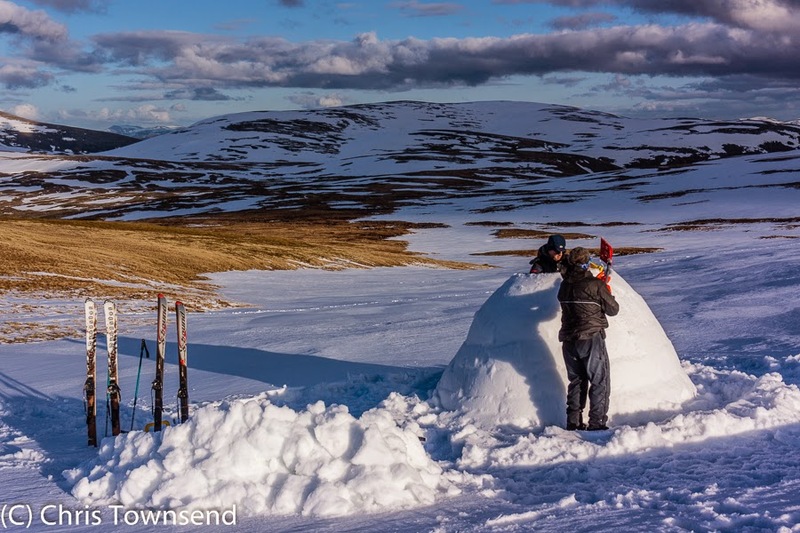 But a last-minute trip with Andy and Roy from the Inverness Backcountry Snowsports Club, re-arranged to fit in with what looked like a brief weather window between storms, resulted in an igloo, and a fine one too. Andy and Roy were on skis, at least when we reached 1000 metres and there was some snow. 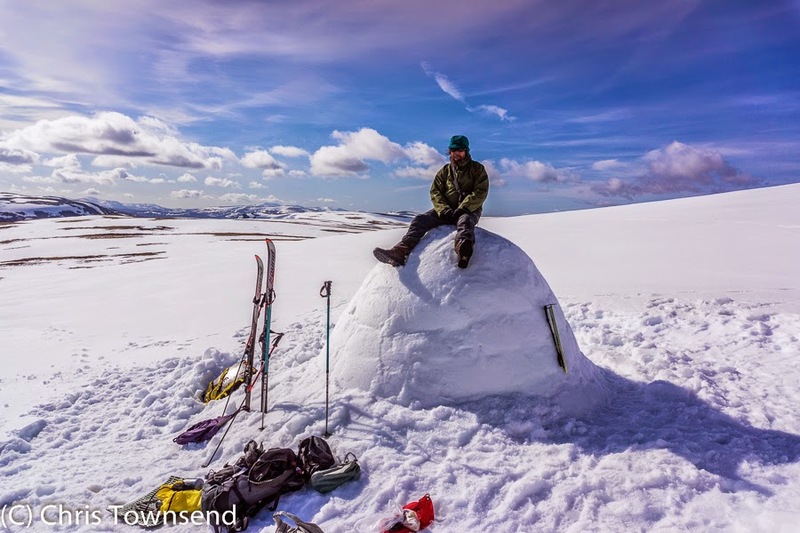 Feeling too lazy to carry skis up I walked, meeting the others on the slopes of Carn Ban Mor on the Moine Mhor in the Western Cairngorms, an area that often holds snow late into the spring. Sure enough there was ample snow - at least three or four feet deep - to build a good igloo with a big doorway dug into the slope below it. The snow was heavy and wet, ideal for making blocks and we made good progress using Igloo Ed's Icebox tool. A cool wind blew as we built the igloo so we weren't worried about it thawing or the sun, which appeared every so often, burning a hole in it, as happened a few years ago. At dusk the wind dropped and so did the temperature. Soon it was below zero and the igloo was setting hard. Overnight it fell to -3.5ºC. The next day we tested the strength of the igloo by climbing onto the top. It was really solid. As I had a tent to test I camped rather than slept in the igloo, which made more room for Andy and Roy. 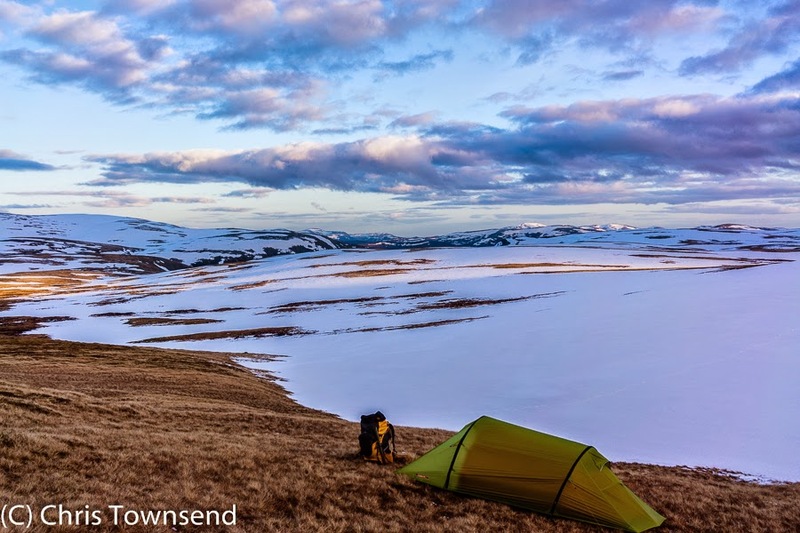 The tent was soon white with frost as I watched the mountains turn pink and a pale moon rise into the sky. It was a beautiful night to be out and I left the doors open. The Moine Mhor was dappled with huge white snowfields and brown and green patches of moss and grass, looking half-way between winter and spring. We lingered the next morning, eating breakfast outside and watching the hills light up as the sun rose above a band of clouds. The skiers decided to head across the Moine Mhor to Monadh Mor as it looked as though they could link snowfields the whole way. 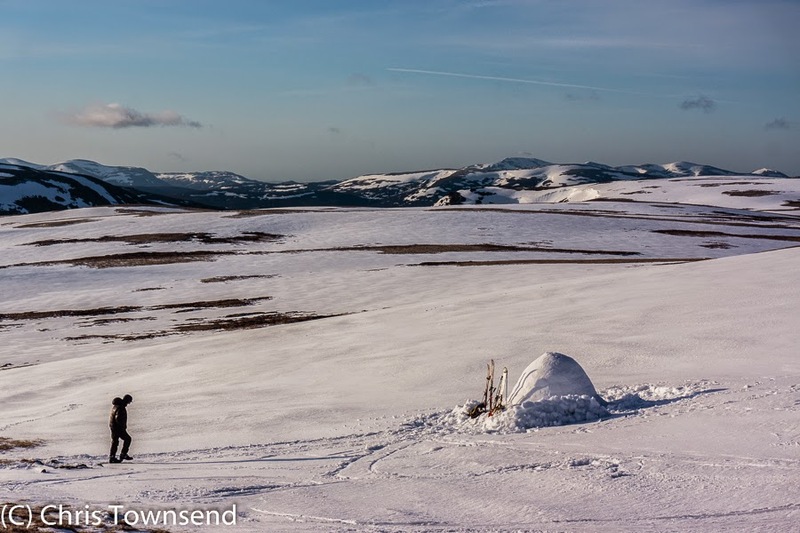 I watched as they telemarked down the slope below the igloo then I turned and headed the other way, up Sgor Gaoith, as that way there was little snow and I could be on stony ground most of the way. 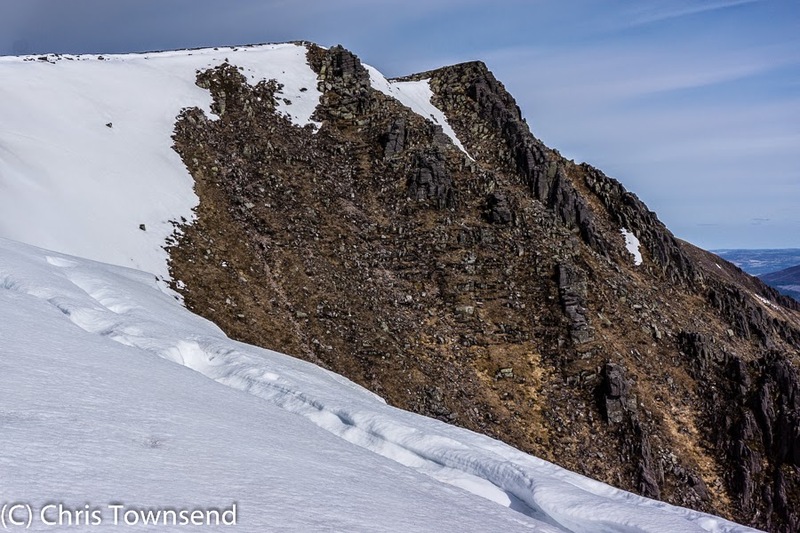 Although the slopes leading to the summit were mostly bare of snow on the steep edge that drops down to Loch Einich there were huge sagging cornices with crevasse-like cracks in them. I wouldn't like to be on or under those when they finally fall. From Sgor Gaoith I looked across the great trench of Gleann Einich to Braeriach then back across the Moine Mhor to Monadh Mor. Two tiny figures were advancing slowly up a snowfield. A cold wind swept the summit as I crossed back over Carn Ban Mor and began the descent. The first day walkers were heading up the path. Those lower down were in shorts and thin tops, a great contrast to my windproofs, warm hat and gloves. I soon learnt why though as I dropped out of the wind and into a red-hot glen where it felt like high summer rather than early spring. On the last stretch of road to the car I felt completely over-dressed even though I was down to my mountain trousers and merino wool shirt. Down here shorts, t-shirt and sandals would have been far more sensible. Back in Aviemore Easter visitors were sitting outside and strolling in the sunshine eating ice cream. It was hard to believe that we'd built an igloo the night before. Has to be done. So want to try a night in a igloo. Fantastic Chris. What a fine night out in the hills.